Wolf Performance Ammunition offers the shooter a great selection for their AK and other weapons chambered for the 7.62x39mm round. The Wolf Polyformance line has a proprietary polymer coating to insure smoother feeding and extraction. This ammo is steel cased and berdan primed, using a non-corrosive propellant. The bullet core is bi-metal, magnetic and has a copper alloy jacket. 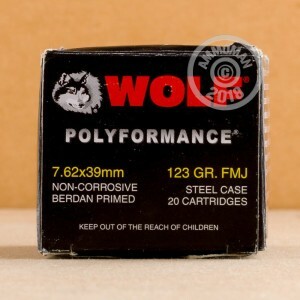 Muzzle velocity for the Wolf WPA Polyformance 7.62x39 ammo is 2410 fps. 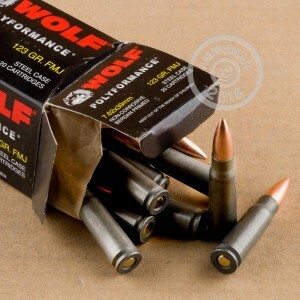 The Wolf Polyformance ammo lineup is designed to satisfy the high volume shooter who wants the very best “bang for the buck” and is backed by Wolf’s 100% Performance Guarantee. Remember! Any order totaling over $99 gets FREE SHIPPING from AmmoMan.com. Stock up today and save!